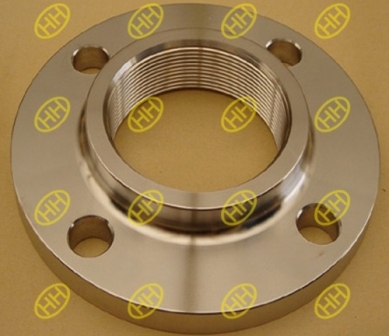 Threaded flange means the inner bore of a flange is thread,the shape of the threaded flange is like a slip on flange,so the threaded flange could be plate shape or with a hub for longer thread. 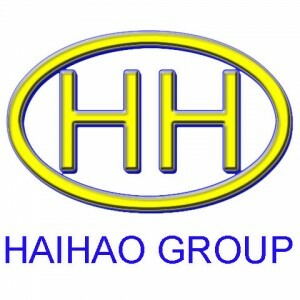 The threaded pipe flange is connected to a pipe with a external thread on the pipe end,so the flange thread should have same thread specification with the pipe thread,the advantage of a threaded flange is that the piping system would be easily to assembly because there is no welding in this piping joint. The threaded flanges are usually supplied with a raised face (RF) or flat face (FF) sealing face.When a raised face is necessary for threaded pipe flanges,the standard height should be 1/16″ for the face under class400.If the threaded pipe flanges is same or more than class 400,the standard threaded pipe flange raised face height should be 1/4″. 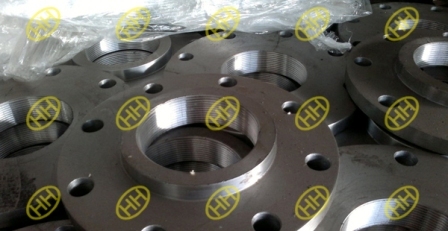 The threaded pipe flange commonly used in a small sizes and not very high pressure situation.The threaded flange is no welding in the joint,it means the flange could be used for some situations which is not able to arrange a welding work.